The Austrian manufacturer has tested Smart Planet Technologies’ reCUP paper cup materials consisting of Georgia-Pacific Masterserve cup stock with Earth Coating and will now move forward with a full scale reCUP recycling pilot within the UK. This follows on from the recent announcement that CupPrint has also licensed the reCUP paper cup technology.Lenzing Papier manufactures recycled paper produced of 100 % recovered fibre. manufactured without optical brightening agents and chlorine bleaching, high whiteness through a converting process for recovered fibre. Will Lorenzi, president of Smart Planet Technologies, told Packaging News this is the first recycling pilot to collect paper cups for use in standard recycling processes to produce recycled paperboard. Lenzing ran trials of reCUP materials for recycling, showing reCUP fully disintegrated within 10 minutes, close to the time it takes for uncoated paper to disintegrate, which Lorenzi said makes reCUP compatible with both traditional batch and continuous repulping, as well as suitable for both repulping as part of a mixed bale or paper, but also repulping paper cups exclusively in support of a recycled cupstock paperboard grade. 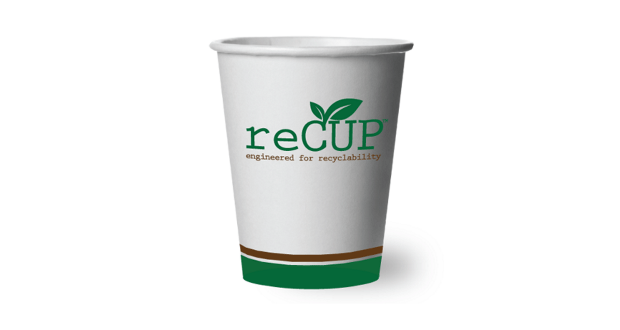 The reCUP paper cup utilises EarthCoating as its interior coating, a mineralized resin coating engineered to be fully repulpable and processable in traditional paper recycling processes and equipment.